Despite boycotts from most non-Islamist forces and large anti-Morsi demonstrations across the country, the Islamist-dominated Constituent Assembly has surprised everybody by announcing it will put the completed draft of Egypt's new constitution to a final vote on Thursday. At the end of a marathon nine-hour session on Wednesday, the assembly also announced another major decision. It rammed through an article that will give the Islamist-dominated Shura Council (upper house of parliament) the power to issue legislation until a new lower house of parliament is elected. The announcement came after President Mohamed Morsi on 22 November gave the assembly two additional months to reach a consensus on the new charter. Granting the Shura Council legislative power could cause a backlash on the street. 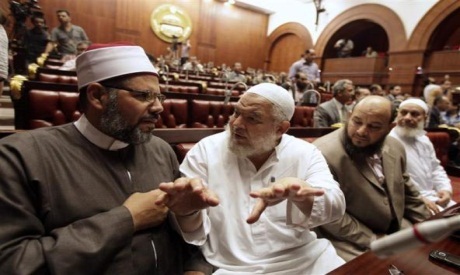 To most liberal and leftist forces, it makes no difference that Islamist President Mohamed Morsi or the Islamist-dominated Shura Council have legislative power because both are subject to the control of one force – the Muslim Brotherhood and its Salafist allies. “You had a hand in drafting this constitution and you should be here tomorrow on a great day to put the final touches to this work. “I have contacted several members who withdrew from the assembly, such as the poet Farouk Guwaida, Ayman Nour and representatives of the Church, appealing to them to attend tomorrow and have the honour of endorsing Egypt’s constitution,” he added. After the vote, the final draft of the 230-article constitution is expected to be sent directly to President Morsi and voted on in a national referendum within two weeks. El-Gheriany told the assembly members last week that they should be prepared to work day and night until Thursday to finish the constitution. However, most political observers expected the final vote to be conducted next week. “It was expected that the final draft would first be released for public debate for a few days and then put to a final vote afterwards, but this did not happen,” said Mohamed Abdel-Alim Dawoud of the liberal Wafd party, who had withdrawn from the assembly. Dawoud argued that El-Gheriany, a former judge with Islamist leanings, might have been subjected to pressure from President Morsi and the Muslim Brotherhood to wrap up the debate and put it to a vote this week. “The Brotherhood might think passing the final draft of the constitution can help them contain popular anger directed at President Morsi, such as was expressed at Tuesday’s huge demonstration in Tahrir Square, and get him out of the current political crisis,” said Dawoud. It is not clear how the assembly will conduct the vote in the absence of around one quarter of its original members (or one third of original and reserve members). According to internal rules, the first reading of the final draft must gain 67 votes to pass. If this fails, a second reading can pass it with 57 votes. In both cases, Islamists – the Muslim Brotherhood and ultraconservative Salafists – have enough assembly members to pass the constitution. A major reason for the non-Islamist boycott of the assembly was that they wanted a majority of 75 per cent for the constitution to pass. “This could have reflected consensus rather than the imposition of control by the majority,” said former presidential candidate and Mubarak-era foreign minister Amr Moussa, who was the first assembly member to withdraw. The drafting process has been expedited in recent days with 50 articles debated since Saturday, most of them regulating controversial bodies like the judiciary, the army, the presidency, the press and the media. Egyptian Secularists & Leftists are really funny and stupid..!! They have the fairly 'elected' president, Fairly 'elected' upper house of Parliament and still they want somebody else to make laws...! Not the elected guys. Now they call themselves democrats... Really Funny and Stupid stance by the Leftists and Secularists..!!! If the Muslim Brotherhood is elected in the passed election and they form a majoraty what is then the problem? Is that because that they will have the dominating power to rule? Here in the West (Europe) also christian parties are within the government and they rule indirected on basis of the bible and we muslims here we have no countervote to them and always overrule us here.. That's democracy NO? The constitution document is drafted for the Egyptian people, and not for the U.N, the West, or the East. We, the Egyptian citizens, need to read,understand, and vote accordingly on the document. Getting this document out of the political fight, to the real owners is the right step. Let the ballot box be the judge. This fight is much about nothing. I recommend that you read the introduction posted at http://www.egynews.net/wps/portal/news?params=201436. I am not sure where where the rest of the document is posted at, I appreciate if AO can post it for its readers. You write here... because both are subject to the control of one force – the Muslim Brotherhood and its Salafist allies. But don't ever forget that these "forces" represent 70 percent of Egyptians. This is what democracy means and what you so easily forget: the Majority rules. And the majority voted Islamist. Being a student could you please what's wrong if legislation powers are given to Shura Council an elected body.Do you mean if a parliment elected by People or a President elected by peopl through ballot box should not have the right of legislation if they have Islamist leanings...? You will only accept a parliment and its right of legislation if it dominates by seculriests and selected through judiciary or through any other means NOT by ballot.Is is democracy you are advocating for...??? Anyone can shed some light on it..? Media thinks egyptions are fouls and they can make the trap through their biased reporting and propaganda.. Even it is not full perfect constitution draft,but it could make Egypt go on in smooth way.That constitution subjected to amended depend on Members of Parliament.Who win the election next time could amended the constitution.Why do you much stick on perfectionism and lead Egypt in chaos. purely majoritarian imposiiton. cannot be legitimate. only a no vote in ratificatory referendum can be authentic under these circumstances. Andrew, what part of the world do you live in, do you live in cave. In the political terms majoritarian is plain simple majority, and majority rules in democracy everwhere in the world. So what are you complaining about. You like to see minority should decide and rule. Go back to your cave. Major fuss is coming from Copts and it cohorts lib, secu, traitors.